Product Tax Code is a label that is assigned to a product or product group and indicates the tax obligations and exemptions customers have when they purchase this product. These tax obligations are taken into account when a customer (user) submits an order. The sections below provide guidance on managing product tax codes, using them to label products and bind products to dedicated tax rules. Navigate to Taxes > Product Tax Codes in the main menu. Click Create Product Tax Codes. 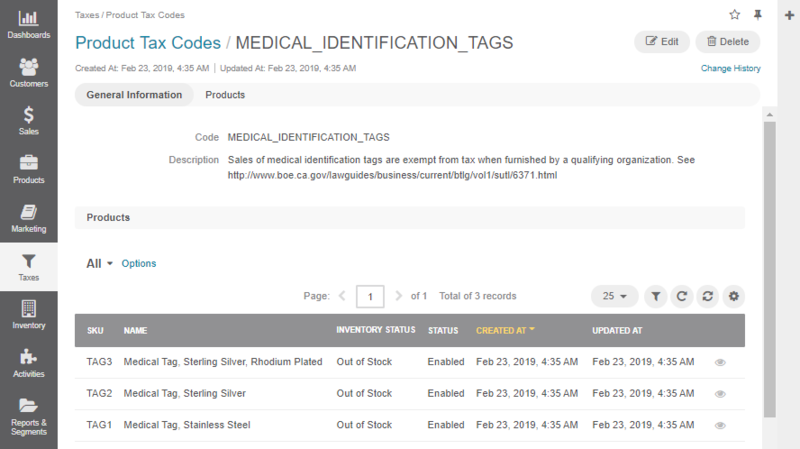 Fill in Code and Description with information about the product tax code you are creating. To view all product tax codes, navigate to Taxes > Product Tax Codes in the main menu. To handle a big volume of data, use the page switcher, increase View Per Page or use filters to narrow down the list to just the codes you need. CODE The unique identifier of the product tax code. DESCRIPTION Detailed description of the product tax code. CREATED AT Date when the product tax code was created. UPDATED AT Date when the product tax code was updated last. View product tax code details — Click on the item to open its details page. Alternatively: Hover over the More Options menu to the right of the item and click to open its details page. Edit product tax code details — Hover over the More Options menu to the right of the item and click to start editing its details. Delete a product tax code: Hover over the More Options menu to the right of the item and click to remove the product tax code. Find the line with the necessary product tax code and click on it. View Change History — See the log of edits of this product tax code by clicking the Change History link to the top right of the page. View details of the product linked to this product tax code — Click on the line with the customer account details. You can edit the product details to remove the link to this product tax code, if necessary. Edit product tax code details — Click Edit to the top right of the page. Delete a Product Tax Code — Click Delete to the top right of the page. Update the Code and Description with new information about the product tax code. You can edit the association of the product tax code with the tax when editing the tax rule details (see the respective topic for more information).